On December 21 1988, 270 people died when Pan Am 103 was blown out of the sky over Lockerbie. It was the worst-ever act of airline terrorism against the United States. It's also been called the world's biggest unsolved murder. 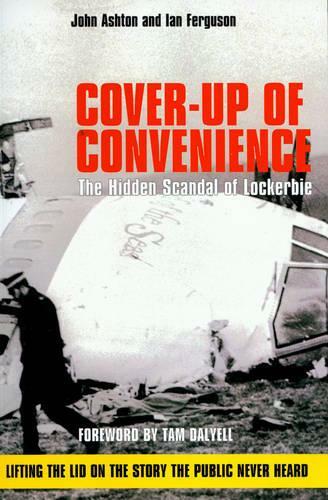 Finally, after 11 years of investigation, political stalemate and legal delays, two Libyan men are facing trial for the Lockerbie bombing. But many observers -including legal and law enforcement officials close to the case -say the trial may not produce a satisfying answer to the question of who bombed Pan Am 103. Cover Up of Convenience will answer the questions that the autoritis wish to bury. It will show that the bombing was anything but a straightforward act of terrorism perpetrated against civilised, western nations by an evil dictator. The shocking truth is that the Western intelligence services were complicit in the murders. From the moment the plane went down, a supposedly impartial investigation was distorted in order to conceal this dark reality from the victims' relatives and the public.